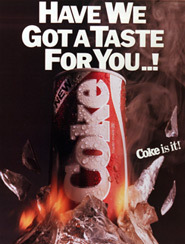 In 1985, The Coca-Cola Company decided to make a change to their world-renowned formula by introducing a new campaign and new taste for their soft drink. It only took days (even hours in some cases) before loyal Coca-Cola drinkers began to share their distaste (yes, I said it) in the company's decision. Needless to say, this day in history is remembered by some as the fall of Coca-Cola. Fortunately for Coca-Cola drinkers, the formula had been changed back to the original and the company has continued to use the original since the failings of 1985. Thinking about this near-disaster, I can't help but reflect on the implications for the Church today. How many times do we try to "reinvent" Church by changing our "formulas" (from worship styles to doctrinal beliefs)? Granted, some of the changes are welcome and much needed so that the Church is constantly working to reach the unchurched in society. But, when we begin to change the foundations upon which the Christian Church was founded, we are flirting with disaster. My experience in ministry has shown me that what people are interested in is authentic faith and Christianity that practices what it preaches. The research by Barna Group that addresses attitudes of 19-34 years to Contemporary Christianity demonstrates that their largest issue with the contemporary Church is that it has lost touch with its roots. They are more concerned with how those of us who call ourselves Christians relate with others and less about what our actual beliefs are. No matter your stand in a particular issue (even the hot-button ones), the ways in which we interact with one another and the world speaks volumes to the faith that we adhere to. In Matthew 3:8, John the Baptist tells the Pharisees and Sadducees to "bear fruit in keeping with repentance" (ESV). Basically, "practice what you preach!" How are we doing in bearing this kind of fruit that resembles our repentance (and even more so, our forgiveness through God's free gift of grace!)? Let's strive to be authentic believers in our private and public lives so that the world may see that Jesus is "The Real Thing".